With over 800 million monthly active users, Instagram is one of the biggest and most popular social media platforms in the world. Instagram is a Facebook-owned app where users can either publicly or privately share pictures and videos. Founded in 2010, it is one of the newest and fastest rising social networking platforms around. While it has historically been ignored by most small businesses, this surge in popularity has led many to begin embracing Instagram as a way to showcase their products and services. 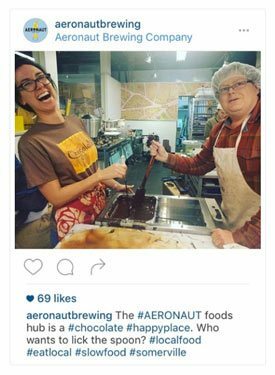 Few small business owners have solid Instagram marketing strategies however. Many business owners assume that Instagram is only for businesses with trendy products to sell, but this is really not the case. The reality is that with a little creativity any business can find success on Instagram. So how can your small find success on Instagram? Here are the 7 Instagram marketing tips that work for every small business. Our first Instagram marketing tip is also the most basic; build a compelling profile. One aspect most small businesses overlook on Instagram (and other social media sites for that matter) is their profile. Rather than simply stating what your company does and adding a web link, focus on making your profile engaging to other users. Treat your Instagram profile as an advertisement for your business. Make it interesting and represent your brand. Give consumers a compelling reason to follow you and click through to your website. Profile Picture – Use a high-quality image that says something about your brand and what you do. Bio – Use your bio to quickly sum up what your business is and what makes it unique. Highlight any special skills you have or awards you’ve received and add in some relevant keywords. Keywords won’t help increase your ranking but will help other users identify what your business is all about. URL – This is the only place where you can place a clickable hyperlink in your profile. Most brands simply put their homepage here. While there is nothing really wrong with this, it is a bit of a lost opportunity. Think, where do you really want your visitors to go? Do you want them to read your blog? Shop your online store? Contact your business? Pick a page on your website that will help you complete that goal and send your Instagram traffic there instead of your homepage. Also keep in mind that once you have set your URL, you can still change it at any time. Have a sale coming up this weekend? Want to grow your e-mail list this month? Change your URL to match your new goal. For example, you could send your followers to a landing page for your sale or to a newsletter sign-up form. As you promote your new goal in your posts simply add in “Link in bio” to let your followers know where they can learn more. Instagram is all about images. If your pictures don’t stack up against everyone else’s you will struggle to find success. You don’t need to go and get an expensive camera though. Here are some tips for how you can take high-quality photos with nothing more than your cell phone camera. If your photos aren’t exactly up to professional standards all is not lost. Tap the edit option after uploading your photos to apply filters, adjust the brightness and contrast, or crop the photo to better fit the 1080px x 1080px standard post size. With a little work you can turn a flat, bland image into a vibrant and beautiful “Insta-worthy” image. 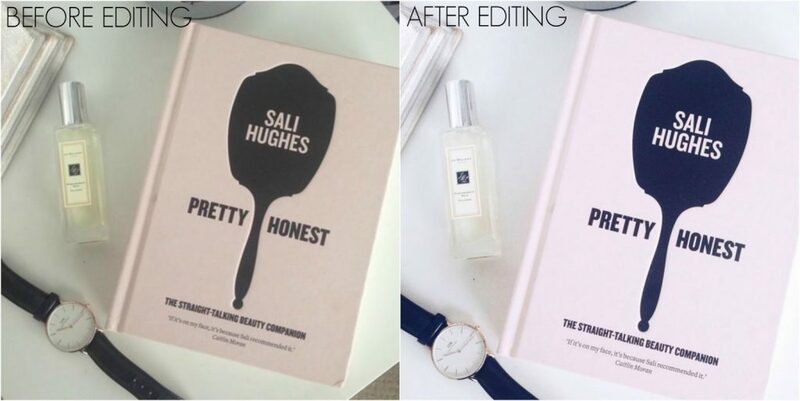 Edit and filter your photos to turn average looking images into professional looking images. It’s not enough just to have good looking images though, Instagram is full of those. To stand out your images will have to be relevant and useful to your audience. How are your images going to add value to them? No matter what you choose to post the main thing is to ensure your images provide something of value to your followers. Avoid posting for the sake of posting. Go for quality over quantity. Don’t make all your posts about selling your products either. While you should definitely highlight your products and their benefits, you should balance this with other kinds of posts. What else should you post? That depends on your brand personality. A brand personality is a set of human characteristics that are attributed to a brand. This personality works to humanize the brand. It is something which consumers can relate to. Begin by defining what personality traits you want associated with your brand. A tech company, for example, might want to be seen as innovative, smart and trendy while an organic food producer might prefer to be seen as simple, rustic and sincere. Define your brand personality and then begin planning posts that will reinforce that personality to your followers. Don’t just post random product photos. If you want to be successful on Instagram, your users need to see you as one of them. This means showcasing human elements. They need to see the personality of your brand, evident in the tone and subject of your your posts. If you have a smart, funny brand, post smart, funny images. If you have a simple, stylish brand then post simple, stylish photos. Your brand personality needs to be consistent and unique to you. To show off your brand personality, post behind-the-scenes images of what you’re working on, places you visit, your staff, your office, your community involvement or anything else related to your business. While this may not always seem the most exciting, a little creativity with posts like these can really make you stand out. Behind the scenes photos add humanity to your brand and can make it more relatable. The most important thing is to be yourself. Faking a personality can’t be kept up forever. Eventually consumers will see through this and your brand will lose credibility. Once that happens it is hard to get it back. Like most social media platforms, success on Instagram is a bit of a numbers game. There are an average over 95 million photos and videos posted to Instagram every day. With this volume of content, you need to consistently post to stand a chance of being discovered. You want to keep your brand on the forefront of people’s minds. If you post infrequently, or at unpredictable intervals, people will begin to forget about you. So how often should you post? Major brands post an average of 1.5 times per day, with some as many as 10 times per day. Unlike many social media platforms where increasing post rate can actually decrease user engagement, on Instagram this is not the case. Post as often as you can while maintaining quality, trying for at least 1 post a day. Take care not to crowd your follower’s feeds by posting a bunch of photos back to back. Doing this means that a small portion of your followers will see a ton of your posts while the majority won’t see any. Space posts at least 1 hour apart to reach as many of your followers as possible. Too many small business owners forget the “social” part of social media. If you look at many small business social media feeds you will see post after post that push products and sales without engaging their audience. People join social media platforms like Instagram to engage with other users, and engagement is a two-way street. Think about having a conversation with someone who only talks about themselves and ignores you when you attempt to talk to them. How long will you continue attempting to talk to this person? Probably not long. The same is true with brands on social media. If you want to be liked you have to engage with your followers on an individual level. This means commenting on relevant user posts, as well as responding to their comments and questions on your posts. Post questions or provide comments that invite users to comment on your posts. Crucially, when users do comment on your post, comment back. Almost 90% of consumers say that their brand loyalty is affected when brands do not respond to their their comments. The current big trend in Instagram marketing (and social media marketing in general) is incorporating “user generated content” into your posts. User generated content is images or videos that consumers create. This content is then curated by brands and used for future social media posts or ads. User generated content is a great way to engage with your followers and generate new content for your feed. Lululemon ask their followers to post photos of them working out in their clothes with the hashtag #thesweatlife. They then feature the best ones on their channel. Instagram enables you to easily access user generated content. Simply create your own unique hashtag and encourage your followers to include it in relevant posts. Take the best ones and repost them on your feed, giving credit to the user that originally posted it. Involving your followers in this way can go a long way to increasing consumer engagement and loyalty. Hashtags are words or phrases preceded by a pound sign(#). They help users discover relevant content and accounts to follow on social media sites like Instagram and Twitter. Using hashtags makes you more discoverable on Instagram; giving you have a better chance of attracting new followers. The right hashtag, or combination of hashtags, exposes your brand to a targeted audience of users interested in things directly related to your products and services. Posts with hashtags also tend to get more engagement than those without them. In fact, posts with at least one hashtag average 12.6 percent more engagement than those without, according to a study by Simply Measured. Look out for “trending” hashtags (hashtags with a sudden increase in use). Take advantage of any that relevant to your brand or your industry to expose your brand to an even wider audience. Don’t add irrelevant hashtags to your posts just to increase your reach though. This ends up looking like spam and your account will quickly begin to lose credibility. Overall, hashtags are a great way to boost your post exposure and reach new audiences. Try to include 5-7 hashtags that are relevant to your brand, products or industry with each post. Remember to also keep in mind your brand personality when deciding which hashtags to use. Allow for more contact information to be added to your profile. Give you access to analytics data. Allow ads to be made within Instagram. To switch to a business profile first open the Instagram app on your phone (business profiles are not able to be set up on the desktop version of Instagram as of the writing of this article.) and go to your profile. Click on the wheel icon on the top left of your profile to access your profile settings. 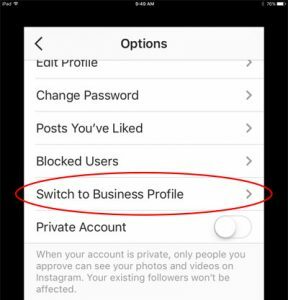 Select “Switch to Business Profile” in your profile settings. It will then ask you to sign into your Facebook account. Once you’ve logged in to your Facebook account, Instagram will show you a list of Facebook pages that you admin. Select your page. 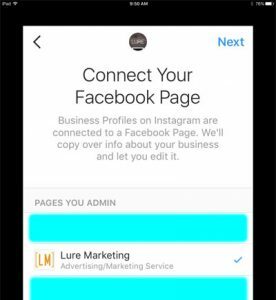 Instagram will then pull your contact information from that Facebook page and add it to your new business profile. You will then be redirected back to your profile, which is now a business profile! You can now access Instagram Insights; Instagram’s built in analytics suite. While not as thorough as other social media analytics suites, Instagram Insights can still provide some very useful information. 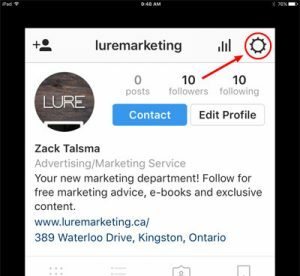 To access Instagram Insights click on the bar graph icon on the top left of your profile, just to the right of the settings wheel. Here you will be able to get data on the reach and impressions of your posts, as well as the umber of website clicks your profile received. Click “See More” on your top posts to get engagement data for those posts. Along with post data, Instagram Insights also gives you data on your followers. Click “See More” on your followers to get a breakdown of your followers by gender, age, location and the days/times they are online. Check your Insights every 2-4 weeks to get an idea of which posts work and which don’t for your audience and use that knowledge to influence your posts for the following 2-4 week window. Consistently doing this will help improve your Instagram strategy and grow an audience of engaged followers. Tap on a post you want to advertise and tap “Promote”. Choose a “Call To Action” for your new ad. This is the action you want users to take when they see your ad (Shop Now, Learn More, Etc…). Choose the destination URL for your ad. This is the webpage you want users to go to after clicking on your ad. Set the Audience for your ad. You can target users by age, gender, interests and location. Set the duration. This is the amount of time your ad will show to users. Once your ad is approved by Instagram it will begin showing to the users you targeted in your “Audience”. To see how your ad is doing check your Insights for engagement rates. 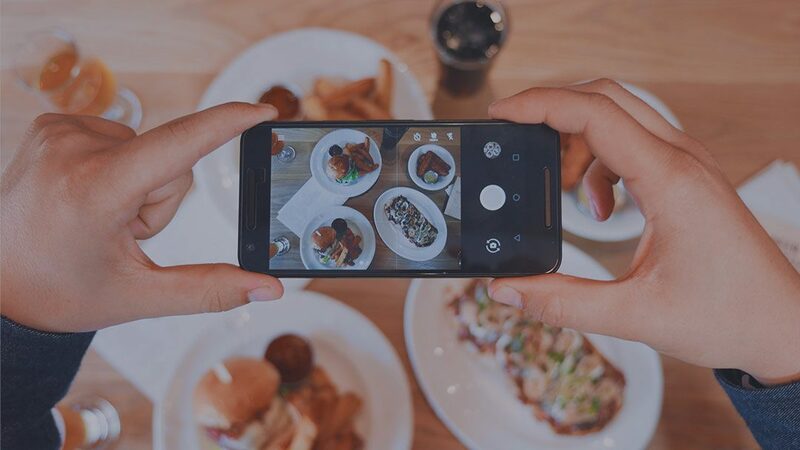 Having only been founded in 2010 and with only 49% of businesses currently using it, using Instagram to market small businesses is still relatively new and very under-utilized. The rapid growth of Instagram means that many small businesses are starting to take it seriously however, with over 70% of businesses expected to using it by the end of 2017. With the right tools and tactics, Instagram can help you build awareness for your brand, increase engagement and drive traffic to your website or retail store.